This document provides the information you need to convert your BRMS backups to Robot Save. You should be aware of the following before you start the conversion. 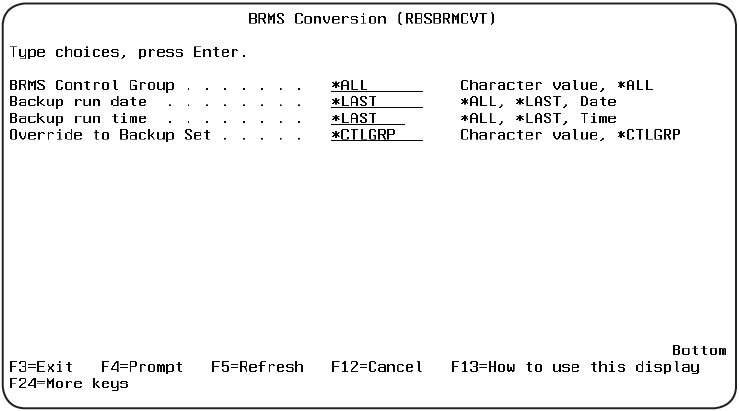 The conversion creates backup sets in the backup class BRMS_CONV_HIST. Domino databases backed up by BRMS are converted to standard IFS data. It is not restorable using Robot Save’s Domino Online Backup process. The backup sets created in class BRMS_CONV_HIST cannot run as Robot Save backup sets. The backup class and sets exist only to allow you to restore the converted data. Because the converted data is intended only for use in restorations, some of the data in the backup set may not be valid if you attempt maintenance on the backup set. Parallel save data is converted; however, Robot Save does not support parallel restorations. A volume that already exists in Robot Save will not be converted. This limitation is checked for all volumes in a Control Group run before converting the run. The conversion utility checks for duplicates based on Class/Set/Rotation using the BRMS run date as the last run date for the rotation. When you remove converted volumes from a Class/Set/Rotation, you also might need to remove them from the Robot Save scratch pool. This is because the media type of the converted volumes does not necessarily match a known media type. This does not impact your ability to run restorations using these volumes. The BRMS data library must exist in your library list. If the BRMS program library also exists in the library list, it must follow the data library. You are responsible for setting up a proper library list. When you run the BRMS Conversion (RBSBRMCVT) command, the conversion report lists multiple control group runs on a single page. The report page breaks occur on a control group. When you select individual runs from the Control Group History Selection panel, each control group run submits a separate job and generates a single conversion report. BRMS does not contain the data necessary for Robot Save to determine whether a file is a source or data file. As a result, all members are restored when a file is restored. If the file is a source file, you might want to restore it to a different library and select the source members you need to recover. Enter the name of the Control Group to convert. Enter *ALL to convert all Control Groups. The RBSBRMCVT command reads through all the Control Group Runs found in BRMS and submits a conversion job to batch for each Control Group Run that meets the selection criteria. 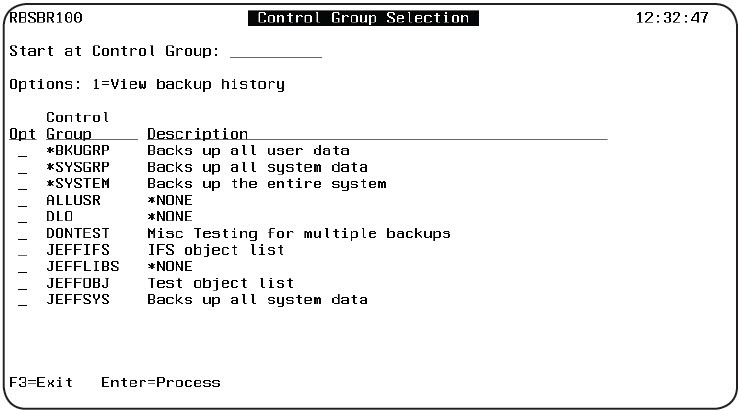 When the conversion process is complete, you have backup sets with the same names as each Control Group and history for the last execution of each Control Group. The default value, *CTLGRP, means that Robot Save uses the BRMS Control Group name as the backup set name. The backup set may or may not already exist. If the backup sets do not exist, the conversion process creates them as necessary. Note: If you specified *ALL for the BRMS Control Group parameter, the Override to Backup Set parameter must be *CTLGRP. 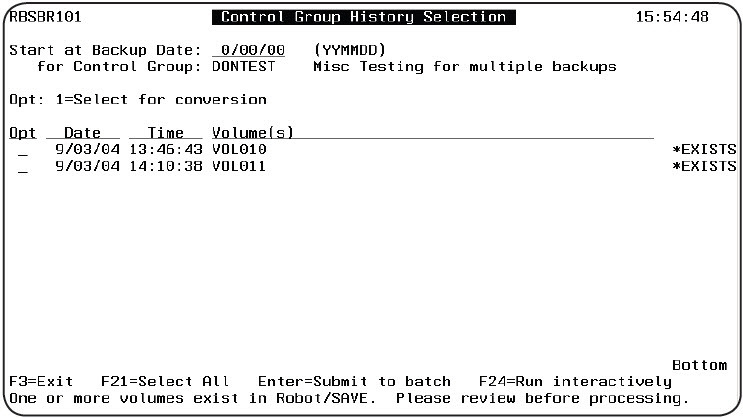 This ensures that all the Control Groups in BRMS appear as multiple backup sets in Robot Save. 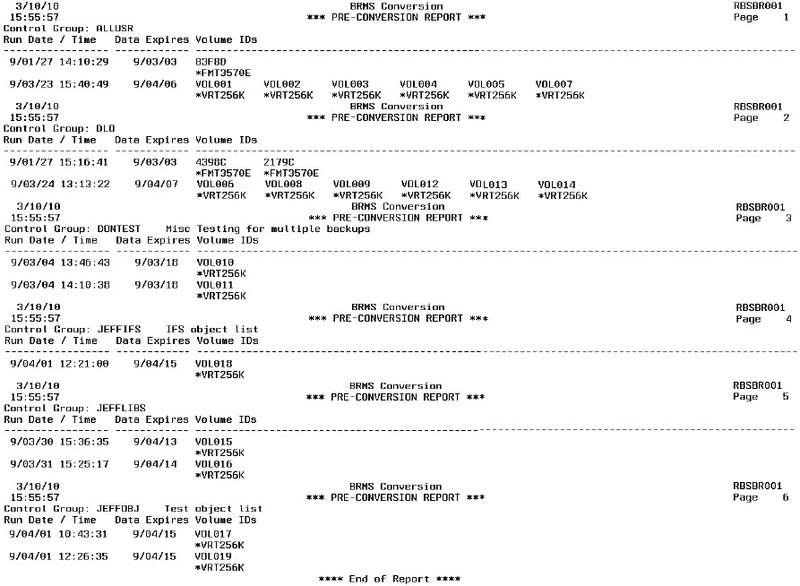 The report lists all known BRMS Control Group runs and is designed to help you determine what data you want to convert. The Control Group Selection panel lists the available Control Groups. Note: The Control Group Selection panel might contain more Control Groups than those that appear on the Pre-Conversion report. This is because the report shows only Control Groups that have run, while the screen displays all Control Groups in BRMS. Enter a 1 next to a Control Group to display the Control Group History Selection panel which shows the history of runs for the selected Control Group. If a volume already exists in Robot Save, the volume is highlighted and a message displays at the bottom of the panel asking you to review the run. To select a run for conversion, enter a 1 next to the run and press Enter to submit the conversion job to batch. If you prefer to run the conversion interactively, select one or more runs to convert and press F24, Run interactively. When each conversion job completes, it generates a report showing the data that was converted. If you press F21, Select All, only the runs shown on the Control Group History Selection panel are selected and converted. If you entered a value in the Start at Backup Date field, it can limit the number of runs that display on the panel and, thus, are available for conversion.